Now here is the fastest way of looking up any word from the dictionary. Maybe not fastest, but the easiest for sure. You need two software installed. History Lookup words are displayed as little boxes . So you can just click any to go back and recheck the meaning. You can see the list of words while you typing. So you don’t have to exactly remember the word to look up. During the setup, select the ‘shortcuts items’ when ‘Choose Components’ screen is showing. Wait , you think that you still have to click on the icons everytime you want to look up the words and that make it not easy? Just hold your horses. You will need to setup Launchy if you haven’t yet. I highly recommend it. Probably my work efficiency has tripled after I installed Launchy. You can execute any program easily by typing few letters of the program name. It is a self-learning app that once you make a relation with a keyword and a program by selecting it from the suggested list, Launchy will show the program as the default next time you type the same keyword. You can execute program , visit websites, or open folder very quickly by typing a keyword. However, you may want to adjust the options to fine tune to make it work properly. Once installed, the default short cut keys are ‘Alt + Space’ to show the search dialog window which is skinable. One more ‘Alt+Space’ will hide it. 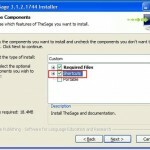 Goto Start Menu and All Programs menu and goto TheSage folder . Right mouse click on the ‘TheSage’ icon and select ‘Create shortcut’. 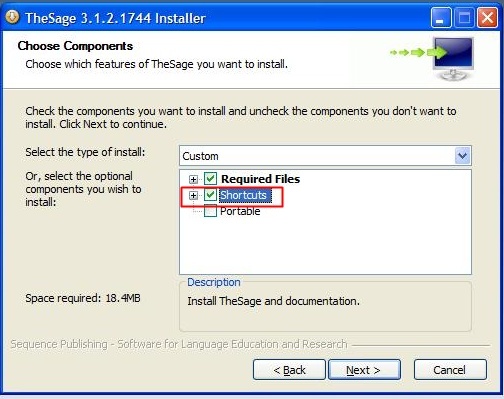 Then a shortcut with name ‘The Sage(2)’ will be created . Once again, right mouse on that short cut and select ‘Rename’ to change the name to ‘dic’ or any word that you can come up righ away. Now ‘Alt+Space’ to show Launchy popup window. Right mouse click on top part of the window and select ‘Rebuild Window’ menu. After that type in ‘dic’ in the text field. Maybe the default program may not be the ‘dic’ shortcut we just created , but in the list showing right under, you will be able to find the entry. Select ‘dic’ shortcut from the list to execute the program. Now the setup is completed. See below screen cast for the demo. Whenever you want to look up a word . Just ‘Alt+Space’ and type ‘dic’. 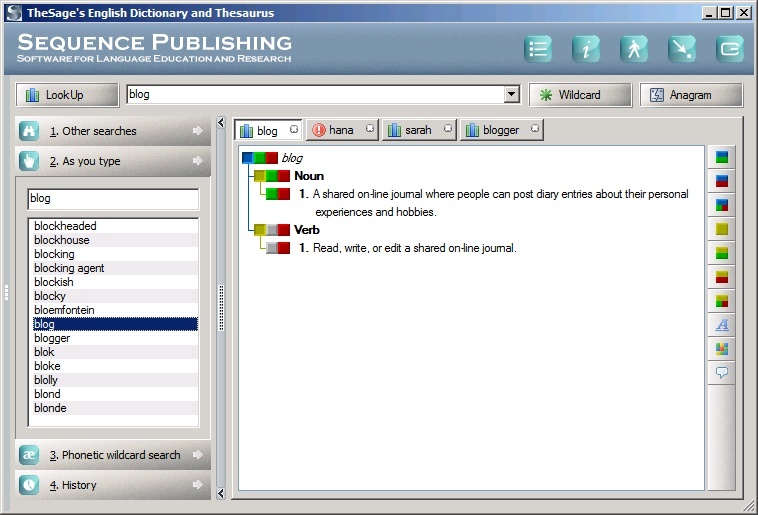 It will bring the dictionary software and you can continue typing the word to look up the word. No mouse movement is needed at all. Just typing. Download from http://launchy.net. It’s a freeware. Launchy is quite convenient and easy to use. The default shortcut keys are Alt + Space which can be easily changed from the option menu that you can access by right clicking on the border of Launchy. It provides slick interface design which is skinable. Also, it is easy to add new executable location. You only need to define the parent folder in the Catalog menu and Launchy will scan all sub-folders and index them too. It is smart and self learning so once you executed ‘putty’ ssh by typing ‘pu’, it will show ‘putty’ as default entry next time you type ‘pu’. One thing that I didn’t like was that it consumes about 18 MB of memory. It is little too much for a simple application, but I guess it’s because of the graphic interface. But I couldn’t find better alternative. Basically I like it because it’s pretty and smart enough to remember my favorite applications. There are some similar free softwares introduced here at Lifehacker.com site. I did tried recently became freeware Enso. It is less intuitive (with no pretty graphics interface, showing only large bold letters on the left top corner) and hard to learn . Also it uses about 34 MB of memory. It was just not for me. With the RocketDock and Launchy, I am in full control of my desktop.